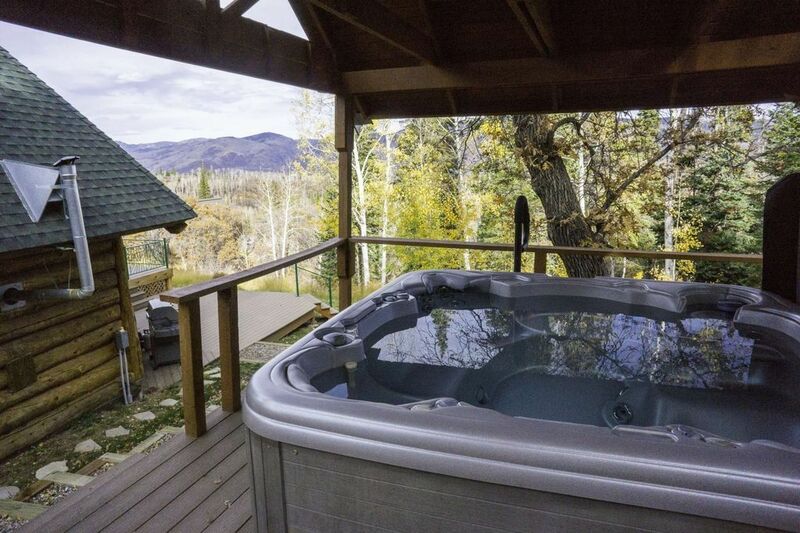 **** Separate main house on property shares hot tub, though main house is rarely occupied. A lot of people choose to vacation in Steamboat because they want to get away from it all. Lucy's Lodge is where people from Steamboat go to get away from it all. Tucked up in the woods and overlooking the entire Yampa Valley, including the ski slopes of Mt. Werner, this cabin-like setting on Lucy's 6 acre property is the perfect retreat. You feel like you are in the middle of nowhere, yet only 6 miles from the base of the ski area. The drive up is an experience itself. Winding roads up through beautiful terrain lead you to your destination. Upon arrival, the panoramic views from the property, especially from the unit and it's large outdoor deck, are breathtaking. You also get use of Lucy's outdoor, covered hot tub (about 20 yards away), which too offers tremendous views and a unique setting you'll never forget. This one of a kind property has a sculpture garden for you to enjoy and you are able to freely hike or snowshoe in the area. In a true cabin-like setting, there is no television but wireless internet is available for those that want to stay connected. 4WD is required to access Lucy's Lodge in the winter. The views are amazing, it’s beautiful here. The internet went out on us on the last couple days and not having a tv here is a bummer. Other than that I had a great time. Great 1 bedroom suite above a garage. I believe Lucy’s home is next door, but she kept to herself and didn’t bother us at all. We had everything we needed including a fantastic view from the balcony. Perfect location, very quiet and private. Beautiful views! This was a lovely time for my wife and I. The hot tub was amazing, and the space was exactly what we needed to disconnect from the outside world and enjoy some time together. This was a great property with easy access to Steamboat Springs. We love the Caretaker Suite at Lucy's! This was our second visit and it was perfect, just like the first. You feel like you are far, far away from all the hustle and bustle, but you are only 10 minutes from the mountain and town. The suite has everything you need to nestle in for a day or as a launch point for Steamboat adventures. We had a great time and will be back again soon! The place is amazing, beautiful, private, quiet, and clean with great views. Jason was incredibly accommodating and helpful. Would love to stay here again. Major Credit Cards Accepted. A 35% deposit is required upon confirmation of all reservations. A $44 limited damage waiver will be applied to all bookings in lieu of a security deposit. Local, State & Federal Taxes 3.9%. Reservation Fee $49 per trip.